Review: 2013-04-20, close fight, high pace and one knockdown: Celestino Caballero vs Robinson Castellanos gets three stars. Robinson Castellanos ranked as the No.10 featherweight in the world, entered the fight with a record of 17-9-0 while Celestino Caballero had a record of 36-4-0 (‘Pelenchin’ Caballero is not ranked as he hasn’t fought since December 31, 2011 when he defeated Satoshi Hosono winning the WBA World featherweight title). 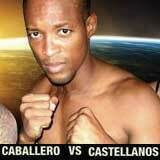 Caballero vs Castellanos is valid for the WBC Silver featherweight title. Watch the video!